On the eve of their parliamentary election, a new poll finds Indians are disgruntled about the state of their nation, deeply worried about a range of problems facing their society and supportive of new leadership in New Delhi. However, they remain fairly upbeat about the economic prospects for both India and the next generation. 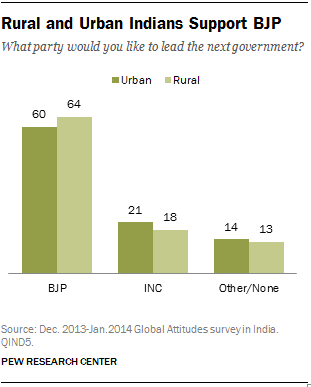 Rural Indians prefer the BJP, despite Congress’ long ties to the rural poor. The Congress party has long drawn much of its support from rural Indians and has pursued policies to solidify that backing, such as the National Rural Employment Guarantee Act and the National Food Security program, both of which Indians overwhelmingly favor. Nevertheless, rural Indians favor the BJP, not Congress, to lead the next government by more than three-to-one (64% to 18%), roughly the same proportion as favor the BJP in urban areas. 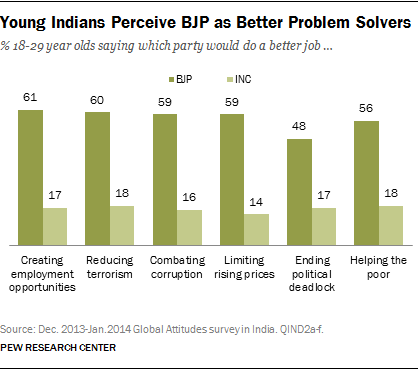 Young Indians think the BJP is best suited to deal with India’s problems. By roughly three-to-one Indians ages 18 to 29 say the BJP will do a better job combatting corruption, creating jobs, curbing inflation, reducing terrorism, helping the poor and ending political gridlock. Indians despair about their nation’s direction but they still have hope for the economy. By more than two-to-one Indians think India is headed in the wrong direction. But a majority (57%) say the economy is good, despite slow growth. Six-in-ten (62%) expect the economy to improve in the next 12 months. And 64% think today’s children will be better off as adults than the current generation. Indians favor America over China. When considering the two superpowers, Indians have a more favorable view of the U.S. (56%) than of China (35%), despite the controversial arrest late last year of India’s female deputy consul general in New York on charges of visa fraud. By two-to-one, Indians are more likely to see China, not the United States, as a major threat. And by more than four-to-one they say it is more important to have strong ties with America than with China. Indians dislike and fear Pakistan, but they want to try to improve relations. Seven-in-ten (71%) have an unfavorable view of Pakistan. And roughly nine-in-ten Indians think Pakistan is a serious threat to their country, with fully 80% saying it is a very serious threat. Nevertheless, nearly two-thirds (64%) say that it is important to improve relations with Islamabad. And 53% favor further talks between India and Pakistan to try to reduce tensions.